The She Voices are a women writers group with diverse backgrounds and experiences. We are currently open to new members. We meet on the first and third Saturday of every month in Richmond-Upon-Thames. If you would like further information, please contact Richmond Lending Library on 020 8734 3330 or richmond.library@richmond.gov.uk. Writer Jean Ashbury walks through developing your characters in prose, with particular focus on the use of dialogue to achieve this. 7 p.m. on Thursday, 20th November, 2014 @ The Tea Box, 7 Paradise Road, Richmond-Upon-Thames. Free Entrance. As the Richmond Literature Festival whirrs on, relax at the fragrant, cosy and delicious Tea Box while learning how to bring your own manuscript into the public arena. Our guest author D.J. 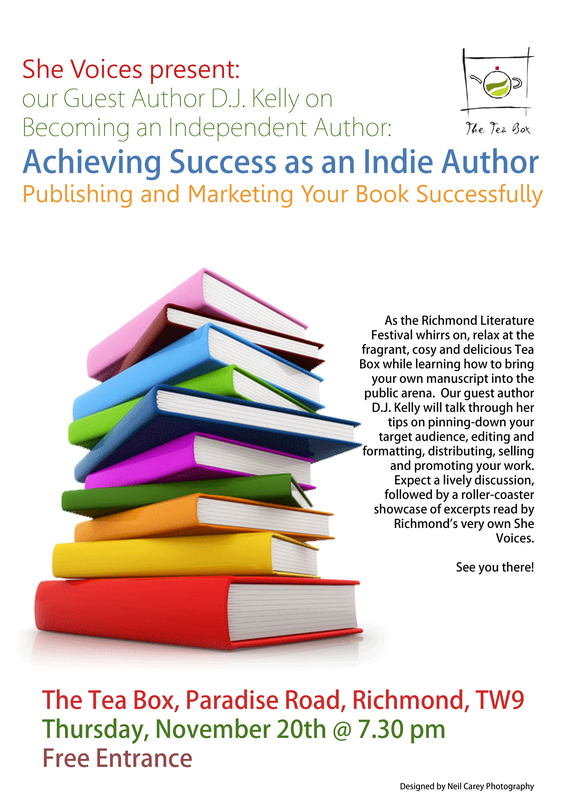 Kelly will talk through her tips on pinning-down your target audience, editing and formatting, distributing, selling and promoting your work. Expect a lively discussion, followed by a roller-coaster showcase of original excerpts and live music performed by Richmond’s very own She Voices on the subject of Human Spirit. Writer Kathleen Cornelia hosts a Free Write session, inspiring writers to express themselves and develop their work.